The New Hampshire state flag's design was ranked 63rd out of 72 flags of U.S. states and U.S. territories), and provinces and territories of Canada in a 2001 internet poll run by the North American Vexillological Association. The Latin motto vis unita fortior means "A united force (is) stronger." The motto was meant to unify the counties and was never officially proclaimed, but was used during the American Revolution until 1784. While no official document prescribing the seal has been located, the first record of the seal is found on commissions issued to military officers by the Provincial Congress dated September 1, 1775. The last known use of the seal was on an act of the General Assembly on July 5, 1776. This seal continues to be published by the New Hampshire General Court on along with the modern seal, on the cover of copies of the State Constitution. Anderson, Leon. History. Manual for the General Court 1981. Hammond A.M, Otis Grant (1919). 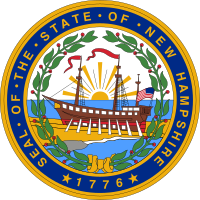 History of the Seal And Flag of the State of New Hampshire. By order of the Governor and Council of the State of New Hampshire. NH State Archives.